The Steinberg UR-RT4 combines the company's acclaimed D-PRE Class A preamps with switchable Rupert Neve Designs input transformers to deliver a rich musical sound with enhanced harmonics. The UR-RT4 offers zero-latency monitoring with effects using dspMixFx software and the interface's integrated SSP2 DSP. Included is the VST 3 Basic FX Suite with the Sweet Spot Morphing Channel Strip, REV-X reverb, and Guitar Amp Classics plug-ins. You also get Cubase AI DAW software for Mac/PC and Cubasis LE for iPad. But it's the Rupert Neve transformers that make the Steinberg UR-RT4 truly special. 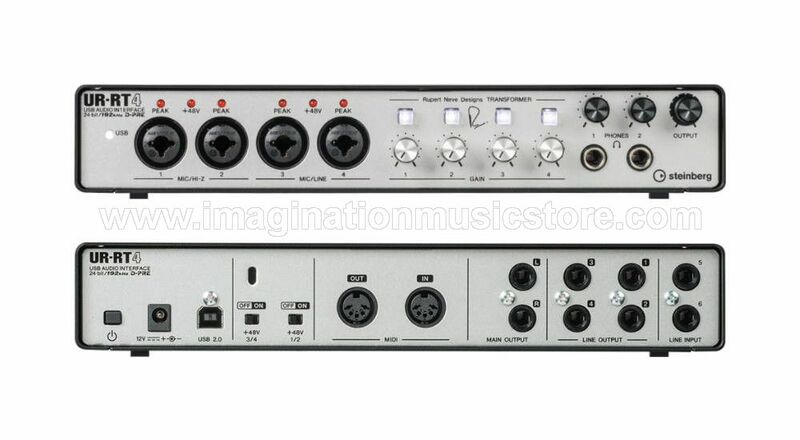 Mr. Neve is a legendary pro audio designer and the UR-RT4 adds his renowned sound quality to a compact 24-bit/192kHz USB 2.0 interface that offers flexible I/O, rugged build quality, and outstanding value. For the UR-RT4, Steinberg's crack team of audio and driver software developers engineered an I/O implementation that gives you both stability and flexibility, with drivers that support ASIO, Core Audio, and WDM standards. This means you can connect to all DAWs that support any of these universal standards. What's more, the UR-RT4 features CC Mode, which enables it to easily connect to your iPad and work with a broad range of iOS audio apps. The UR-RT4 includes Cubase AI, a streamlined version of Steinberg's world-class Mac/Windows production environment. On the road? Download Cubasis LE from the App Store for an enticing palette of recording and mixing features optimized for touchscreen operation on your iPad. Especially cool is the fact that Cubase can open Cubasis LE projects, so you can quickly capture your musical ideas on your iPad, then transfer them to Cubase for further development in your studio. With this degree of flexibility, you can take projects from concept to mastered album — all with one compact and cost-effective piece of hardware. 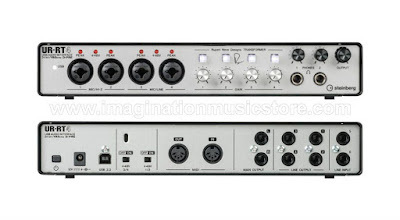 Notice Rupert Neve's signature on the UR-RT4 faceplate. That's the Rupert Neve, the pro audio legend whose electronics designs defined the golden age of analog. Those of us at Sweetwater who have had the privilege of working on a Neve 8078 or its predecessors can attest to the fact that Neve's Series 80 consoles were indeed the pinnacle of handwired analog mixing desks. Mr. Neve has remained at the forefront of audio-circuit innovation for over half a century, and his current company, Rupert Neve Designs, continues to advance the state of the art with cutting-edge products that sound incredible and intelligently address the challenges of the digital age. The inclusion of Rupert Neve Designs input transformers in the Steinberg UR-RT4 makes this legendary sound available in a budget-friendly USB 2.0 interface.